The PLANET ADSL 2/2+ VoIP Router - IAD-200, and 802.11g Wireless ADSL 2/2+ VoIP Router - IAD-200W, provide ISP or residential Home Users the ideal solution for sharing a high-speed ADSL 2/2+ broadband Internet connection on a 54Mbps wireless network (IAD-200W) and a 10/100Mbps Fast Ethernet backbone and also with the capability to make the calls through Internet. They can support downstream transmission rate up to 24Mbps and upstream transmission with rate up to 3.5Mbps while upstream transmission. These products support PPPoA (RFC 2364 - PPP over ATM Adaptation Layer 5), RFC 1483 encapsulation over ATM (bridged or routed), PPP over Ethernet (RFC 2516), and IPoA (RFC1577) to establish a connection with ISP. Via the user-friendly management interface, IAD-200/200W can be managed by workstations running standard web browsers. Furthermore, both of them provide DHCP server support, virtual server, DMZ support, VPN PPTP/IPSec pass through, and URL filtering capability. 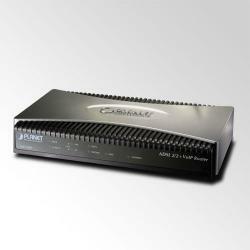 The IAD-200/200W also serves as an Internet firewall to protect your network from being accessed by outside users. Not only provides the natural firewall function (Network Address Translation, NAT), but provides rich firewall features to secure a user's network. All incoming data packets are monitored and filtered. Besides, the FXS interface and SIP (RFC3261) protocol offer the capability to make the call in a cost-effective way, either through Internet or local phone system.